and wrote to. Mr. Kadet was also a collector and dealer in vintage TV Guide magazines. The sign-off features the voice of Norm Stevens. Some of you may remember him as the voice-over for The CBS Late Movie (1972-1985). The 1964-vintage WCBS-TV ID slide was contributed by William Brown of New York City, who helped me identify the announcer. The audio is from the collection of the late Jeff Kadet as is all of the audio-only clips on this page.  The mid-1960s WTOP-TV ID graphic comes from Dave Hughes' DCRTV.com, a site devoted to Washington and Baltimore-area broadcast media. The Seal of Good Practice (SOGP) is from my own collection of images. networks or any other entity.